Let’s Create a Dragon Together! We’re back with another “Twitch Draws” live stream where YOU’LL be in the artist’s chair! You’ll vote on key creative choices and make a new Dragon together with one of our Dragons artists! We’ve drawn a Dragon, Dragon Rider, and portrait on stream, but this time, we’re doing things a little bit different. Instead of drawing a concept together, our guest artist Kurt will be sculpting a Dragon live on stream! This will be the first ever “Twitch Sculpts A Dragon”! A few weeks ago, we asked you what theme you’d like this Dragon to be in. Because the Dragon will release sometime during the Fall Season, we went for some more spoooooooky themes. 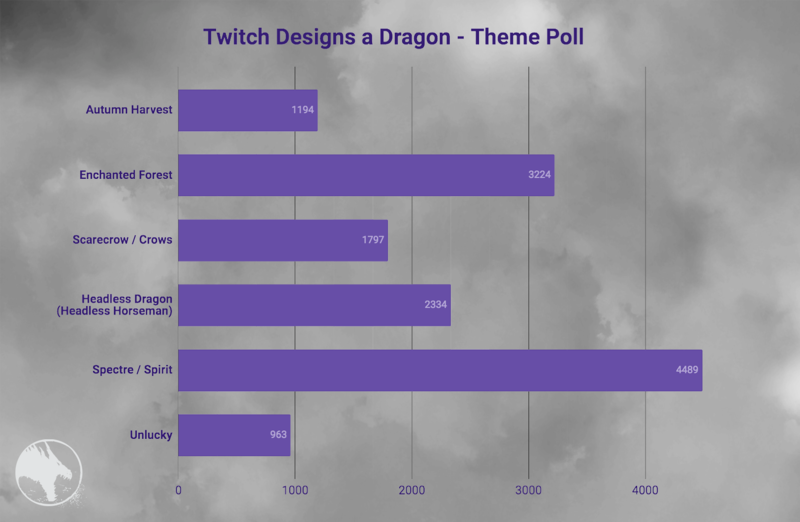 With over 8,000 responses, our winning theme for this Dragon is: Spectre / Spirit! So, we know the Dragon will release in the Fall, and we now know what the theme will be… that means we’re just about ready for the stream! So, when is it happening anyway? 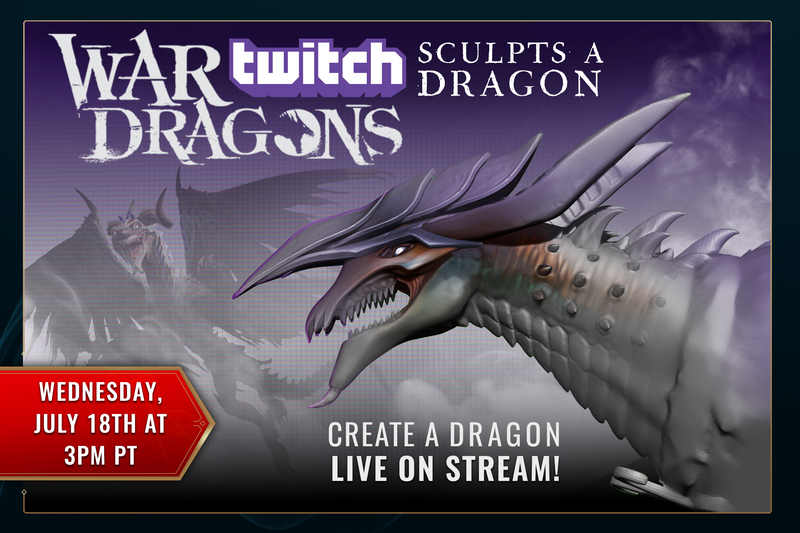 The very first Twitch Sculpts A Dragon will take place on Wednesday, July 18th starting at 3pm PT. It’ll run for about two hours, until our sculptor thinks we’re good to go with a first pass at the Dragon. To give you an idea about how this stream will work, check out one of our previous Twitch Draws streams from the past! Kurt’s work is unparalleled here on the Dragons team, and we’re super excited to see what he’ll sculpt on stream with you! Here’s a quick Q+A to learn more about our artist prior to the stream. What do you do at PG? I'm the principal character artist at PG. I help design, model, texture, and render our characters. I’m responsible for setting an example for visual styles and execution across multiple projects at the company. When did you know you wanted to work on games? I originally just wanted to sculpt and design creatures or characters, primarily for the collectibles industry. Seeing movie maquettes in books and behind the scenes documentaries pulled me in at a young age. I landed in games out of college; it was my primary focus through school already so I was somewhat prepared for the ins and outs of it all. Seeing the direction game art was going at the time, taking advantage of high poly sculpting, I was way more excited about taking my skills into games. What work have you done in the past, games or otherwise? Anything we can show off to the folks at home? I've worked in both movies and games; more recently I've been doing some work for collectibles which makes me super happy. Some notable games I've worked on include Evolve, Rift, Wildstar...I did a little for Doom at one point, and some other older titles that have been forgotten by gamers haha. Some of my favorite work has been in film; I was very thrilled to be part of 10 Cloverfield Lane developing the creature concepts for the movie. I've done some other work for Chinese films as well, and a handful of unannounced projects that I hope someday will hit the big screen. What is modeling? Why is it important? Modeling is the process of creating 3D objects in programs like 3dsMax, Maya, ZBrush, Modo, and many many others. We move vertices around, which are connected with edges, and those together form polygons, which are the 3D characters and environment art you see in many modern games. Without it, many of our games would still be two dimensional sprite based games or built on pixel art. It's another way of telling a story and creating an experience. It's reached a point now where modeling is matching real world sculpting; it's like working with clay but without the messy space needed to maintain all that material. Where does modeling fit into the development process? Because it's evolved to be so similar to sculpting, modeling can, at times, be done right at the beginning in a conceptual way. It’s where we can play with the forms and design of a character on screen with the geometry, squashing and stretching the polygons as we need it. Typically, modeling comes in after the concept stage. A concept artist will work with the art director to design an interesting character that works with the required gameplay. This gets handed off to someone like me and I’ll take it further visually by modeling it out, and in some cases, the design will also evolve due to this. After modeling, or sculpting the character, it will get a texture pass or color pass, which is what you see in game. All this continues on to the animation team where they breathe life into the character, and it becomes interact-able with the player. What is the day-to-day life of a modeler? My day to day varies. There’s a lot of little technical things that need to get done when managing character assets. It's not all just sculpting and painting! You have to manage all the texture files, and in some cases, a character is made up of multiple models, so all of these things need to be maintained and in sync with each other. Most of my time is spent in programs like ZBrush, playing with digital clay. What tools do you use to model? As I mentioned before, it's mostly ZBrush for me. I use Maya as well, for some of the necessary technical steps like UV mapping, and animation prep. But a lot of the creative space is in ZBrush, which is also what I'll be using for this stream! What's your favourite War Dragon? THAT is a good question, I would say Kaiju. But Wraith is a close second. Where can folks check out more of your work online? I'm a pretty easy one to find. ArtofKurt.com is my hub. From there, you can find my instagram, facebook page, and my ArtStation as well. Hope you enjoy the stream! And thank you for playing our games!!! We can’t wait to get this stream started on July 18th. Be sure to Subscribe to War Dragons on Twitch to be notified when the stream goes live!